The high profile departure of Peter Oborne from his position as the Daily Telegraph‘s chief political commentator has sparked a fierce debate about editorial integrity. It is an important debate and one that should be carried out in public, in front of and involving the readers and audiences we all crave and which commercial departments have to monetise. I have worked in business-to-business media, mainly covering financial services, for over 30 years and the tension between commercial and editorial departments has been a fact of life for my entire career. At its best that tension is creative and inspiring; at its worst it is sordid and dishonest. There are plenty of examples of both ends of that very wide spectrum played out daily in newspaper, magazine and website offices. For me transparency, honesty and integrity have always been the cornerstones. Can sponsored content really add value? Sponsored editorial content has been around for years and can provide readers with valuable, high quality information, especially in business publications. The challenges for an editor when presented with a sponsored content opportunity are to win the trust of the sponsor and then to ensure that readers know the content is sponsored. What the sponsor is buying is access to your audience, your readers. If they are remotely intelligent they will also realise that they are buying a partnership with your brand and its values because that it what the readers buy too. For me that always meant working with sales teams and sponsors from an early stage to set the objectives, content and style of any sponsored content, an approach that applies to print, online and events. This has worked many times and when it does it delivers great content for the readers and real value for sponsors. When it doesn’t work – for instance, when a dumb PR person gets hold of it and thinks it should be all about products and mention the company in every other paragraph it becomes a waste of everybody’s time and money: readers will just flick past it whether it is on page or on a website. The second challenge is to get it labelled clearly: tell the readers it is sponsored. This has actually proved the harder battle to fight over the years and has undoubtedly got harder in the digital era. I believe readers appreciate the honestly and clarity. They are perfectly capable of making up their own minds what delivers value to them and do not want to be misled. Just about every market I have worked in has been blighted by a bucket shop “ad-for-ed” competitor which thinks its readers are stupid and can’t spot the correlation between who is advertising and the coverage they get (or don’t get in the case of HSBC and the Daily Telegraph). It is a fools’ game, a race to the bottom and hardly ever a recipe for long term commercial success. Quality advertisers and sponsors want to be associated with quality editorial products and readers want to be able to trust what they are reading: holding the line on this nonsense will pay off in the long term. Transparency applies in other ways too and the national newspapers have been poor at this for years. I give you one example to illustrate the point. Just over ten years ago the switch by large numbers of insurance companies and others to call centres and back offices in India was generating alot of comment and I contribute my fair share to that. The chief executive of one insurer – Patrick Snowball at Norwich Union (Aviva) – took me to task over some of the things I wrote and said it was ill-informed and I ought to go an see for myself. I politely pointed out that my modest editorial budget was not going to stretch to a trip to India so he responded by offering to take me (and a couple of other journalists) to India for a week to visit a range of call centres. I went and wrote several articles on Indian call centres for the various publications I was working across at the time and at the end of each one I put a footnote saying the trip was paid for by Norwich Union but that they didn’t exert any influence over what I wrote (not even a request for a quote check – another real blight on modern journalism). To me that left the intelligent reader to make up their own mind on the value of the content. I call that honesty. These trips go on all the time and I hardly ever see mention of who paid for them in articles or alongside videos. Why? There have been times when I have not been flavour of the month in advertising departments, especially when writing something that upsets one of their major clients. This is where editors and journalists have to have thick skins but also be prepared to justify what they have written. My favourite story is about the collapse of Independent Insurance in 2001. Two years prior to that I had a big – I mean big – falling out with the chief executive of Independent Insurance Michael Bright over something I had written which got under the skin of his considerable ego. Unable to sue me (I found out years later he had lawyers crawling all over what I had written but it was quite simply true and fair comment) he decided to withdraw all Independent’s advertising and sponsorship from Post Magazine, the main title I worked on at the time and back our competitor Insurance Times to the hilt, along with other fringe titles. This made for some uncomfortable conversations with our advertising department but I was not prepared to backtrack on what I had written and, to give them credit. they understood my stance even though the sight of large Independent adverts elsewhere must have caused them constant grief and individually cost them money in lost commission and bonuses. Vindication came two years later when Independent collapsed, leaving in its wake a long list of creditors, including Insurance Times which never got paid a six figure sum for advertising it had gladly taken from Independent. I couldn’t help feeling certain sense of vindication. 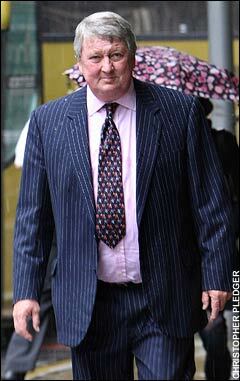 Six years later I sat in Southwark Crown Court and watched Bright sentenced to seven years imprisonment for his part in leading the fraud that brought Independent down. 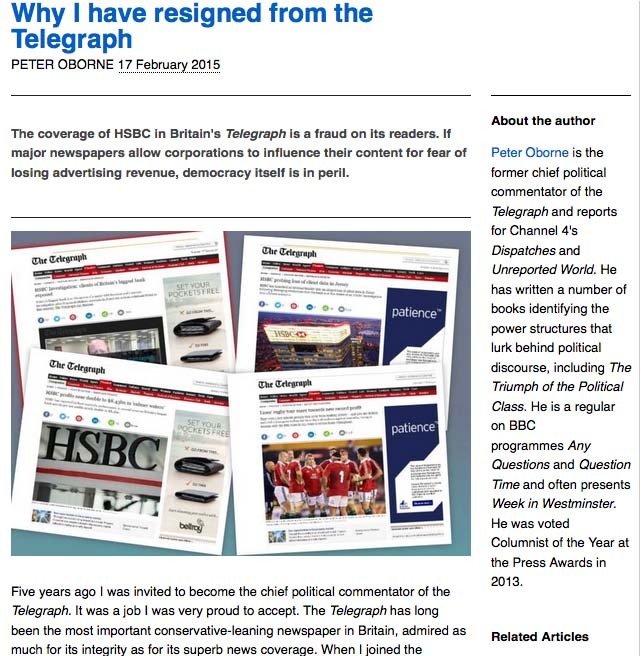 Peter Oborne has lifted the lid off a murky world and has done the media and the public who depend on it for honesty, complete and impartial coverage of the issues and industries that matter to them a huge service. If it helps restore some of the balance between editorial and commercial departments so they can work in partnership and not with one dominating over the other then we will all be better off.